Performance of AMD’s upcoming Trinity APU’s (Accelerated Processing Units) have been unveiled, Preliminary results show that the Trinity APU’s which feature upto four x86 Cores based on the latest Piledriver architecture have better Integer and Floating-Point performance compared to Bulldozer at same clock speeds. The results gathered by Citavia pit the desktop A10-5800K and Mobile A8-4500M and a few other APU’s against some of the recently released Bulldozer and Sandy Bridge processors. The benchmarks used were mostly Single Threaded which give a more fair idea of the Single core performance increase. Compared to Bulldozer FX-8150, The A10-5800K at same clock of 4.2GHz pumps out an average 10% increase while the mobile parts show upto 20% core performance increase. Comparing these results we could see upto 15-20% increase in the Piledriver (Vishera FX) based desktop lineup which launches around Q3 2012. 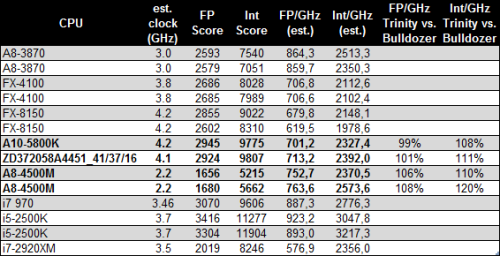 The worse part is that while trinity may seem faster than bulldozer at clock-to-clock comparisons, its performance is pretty underwhelming compared to the Llano APU’s (A8-3850/3870) which are also shown in the comparison chart.